Grilled eggplant sandwich with Mozzarella cheese. Don't have a kitchen grill? No worries, this eggplant sandwich can also be prepared in your oven's broiler. With under 300 calories per sandwich, this is also a low-calorie recipe. Like this grilled eggplant sandwich? Here's more vegetarian (and vegan!) sandwich ideas. Preheat grill or set oven to broil. Place eggplant and sweet bell peppers on grill (or on a baking sheet for the broiler), and season well with salt and pepper. Grill 5 to 10 minutes, until tender and lightly browned. Remove from heat. Lightly grill bread on one side. 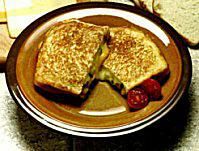 Turn over to grill on opposite side, adding Mozzarella cheese to grilled side of four slices. Cheese should soften but not melt. Layer eggplant and bell peppers on top of cheese, and add Parmesan cheese. Top with remaining 4 slices of bread. Serve immediately. Nutrition: One sandwich provides approximately: 219 calories, 9 g protein, 34 g carbohydrates, 5 g fiber, 6 g fat (3 g saturated), 11 mg cholesterol, 76 mcg folate, 2 mg iron, 414 mg sodium. What's a Delicious Recipe for Chessy, Vegetarian Potato Soup?